I haven't done the candied apples or pears yet because when I got back from PA I burned through six boxes of Tastykakes and four bags of Herr's potato chips and put on three pounds, which need to come off before I eat a lot of sugar again. Hmm. I need to give you all my wine-poached pear recipe, but I need to make it first so I can remember amounts. - Preheat oven to 350 degrees with rack in center. Rub the bottom and sides of an 8-inch round cake pan with 2 tablespoons butter. In a small bowl, whisk together 1/2 cup sugar with the cinnamon and allspice. Sprinkle mixture evenly over bottom of pan; arrange cranberries in a single layer on top. - With an electric mixer, cream remaining 6 tablespoons butter and 1/2 cup sugar until light and fluffy. Add egg and vanilla; beat until well combined. In another bowl, whisk together flour, baking powder, and salt. With mixer on low speed, add flour mixture to butter mixture in three batches, alternating with the milk, until well combined. - Spoon batter over cranberries in pan, and smooth top. Place pan on a baking sheet; bake cake until a toothpick inserted in the center comes out clean, 30 to 35 minutes. Let cool on a wire rack for 20 minutes. Run a knife around edge of cake; invert onto a rimmed platter. For the next time I make it, I will use twice the cranberries the recipe calls for- it needed more. I will also bake the cran/sugar/spice mixture for about ten minutes before I pour in the cake batter, because the berries and sugar didn't make quite enough syrup to soak the cake. If you give them a bit of a head starrt, it will help. Also, I'd make it in a Bundt pan- a flat pan looks pretty, and works fine, but it had a tendency to stick when I inverted it, and people who have used Bundt pans say it works better. I'd also add about 1/2 tblsp of melted butter to the cran/sugar/spice mix to help the syrup along. Overbaking the cake (after the toothpick is clean +5 min) helps make a denser cake; also I might take a skewer to the cake itself while it's cooling to make channels for the syrup to run. I put a little vanilla extract in the cran mixture as well, just because I like it. Because I love you guys, and you are all awesome, I am sharing my family's Super Sekrit Shrimp Dip recipe. This stuff is so good that once mom made it to take to a holiday gathering (two pounds of shrimp, no less) and she and David and I ate it ALL standing around the kitchen table and had to bring something else to the party on the fly. This recipe is easy to adjust for more people; just double the amounts and it works fine. 1 lb shrimp, cooked, chilled and peeled (no shells). If I am in a hurry, I have in the past bought precooked shrimp at the store and it works fine, but I prefer to cook the shrimp myself, in beer, if I have it. Coarsely chop shrimp (I do it in the food processor, on "pulse", so it's a nice coarse grind- don't make into a paste, leave some texture. Like if you were making shrimp granola.) and chill. Mix mayo, salt, lemon and curry together to make a smooth sauce. Fold in shrimp, mixing thoroughly. Chill for 1-2 hours (if you can, we never get that far ). It's an incredibly simple recipe, and so delicious. My favorite Christmas cookies, from a recipe printed in the local news paper years ago. They're called Festive Fudge-Filled Bars, but around my house we always just called them Chocolate Bars. 1 cup brown sugar, firmly packed. Combine oats, flour, nuts, sugar, soda and salt; mix well. Add melted margarine and stir until mixture resembles coarse crumbs. Reserve 1.5 cups of mixture and press remaining mixture into the bottom of a well-greased 15.5x10.5 inch jelly roll pan (cookie sheet) Make sure you push it into the corners and don't leave any holes. Bake in a 375 degree oven for 10 minutes. Meanwhile, melt shortening in a heavy sauce pan. Add 1.5 cups of the chocolate chips, stir over very low heat until the chips are melted. Remove from heat and stir in the condensed milk. Spread over the partially baked crust, leaving a .5 inch edge around the pan. Combine the reserved crumb mixture with the remaining chocolate chips and coconut if your using it. Sprinkle over the chocolate, pressing in lighting. Bake for 20-25 minutes until lightly golden brown. Cool and cut into bars. Also, you should most definitely lick the pan, because the melted chocolate/condensed milk mixture is heavenly. Oh, man, I LOVE those things, but they are so expensive (and so high-calorie) that I don't make them often. I do mine with pure butter and not margarine or oil, and I use butterscotch AND chocolate chips. Yeah, we use butter these days too, but I've never tried it with butterscotch. I'll have to do that next time. 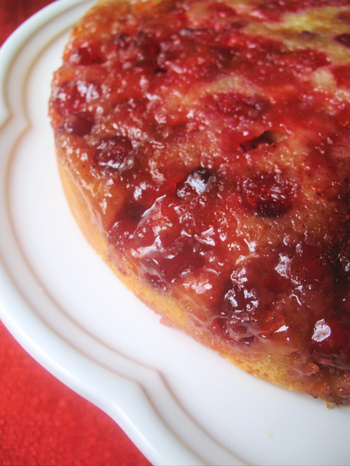 Just had some of the cranberry upside down cake. Yummy! Followed Rose's advice and used more cranberry's than the recipe calls for (I didn't measure, just used a full package). She also suggested that I cook the cranberries on the stovetop before hand, which I did. It got a nice syrup going, but next time I'll cook them down a little further to increase that syrup amount. I also melted some white chocolate and drizzled it over the top. Not enough that it covered like a frosting, just enough to add a little extra decoration. Ooh, white chocolate. That sounds yummy. I made an on-the-fly cranberry sauce (now new and improved, with explosions!) and here's the how-to. 1 bag of cranberries (wash them) and let them sit in a bowl unrefrigerated for a week. If not the almond sparkling wine, use 1 teaspoon almond extract in the wine. Put the cranberries into a metal pan on high heat. Slosh in about a cup of the wine. Bring to boil. Boil for about 5-10 minutes WITH THE LID ON THE POT, until the cranberies stop exploding. Simmer on medium/low (bubbling, not boiling) uncovered, periodically adding in more wine, until the cranberries become a thick sauce. Add sugar and stir; I used very little sugar, because I like tart sauces. After three tries, I also made perfect popovers. Calvin also enjoyed our dinner. He got in trouble because one of my guests was feeding him under the table. The guest got in trouble, too. Dessert was a raspberry tart, and for drinks I got a friend to bring those fabulous Pellegrino Arunciata and Limonata. My wife made some deviled eggs with bacon in place of the sweet relish. They were very good, and I'll try to post the recipe once I am no longer swamped with work. Mmm. Bacon. I didn't know you used relish at all. My mom never did. Sorry I've been scarce around here. I've been super busy. But I found time to type this out and pass along. I think they taste better after they sit in the 'fridge overnight, myself. milk, add the milk 1 tbsp at a time. Spread over cooled cake. I substitute butter when making it. Try it over a chocolate cake. Or just eat it out of the bowl. I'm still waiting for an excuse to make Rebellious Rose's Super Secret Shrimp Dip. Don't worry, I'll let y'all know how it turns out when I do. Allow mixture to cool, then stir in OJ. Refrigerate until mixture is cold (optional). Transfer to air tight container and move to freezer to harden (optional). Cooling before mixing should give a smoother texture. Letting cool further in a freezer for a couple of hours firms it up more. I recently discovered that my ice-cream maker makes AMAZING frozen yogurt. (Heck, I recently discovered my ice-cream maker!) I've been using Greek plain yogurt (Cabot Dairies); full fat, full flavor, mixing it with fruit or whatever comes to hand, and it's incredible. So far I have made honey-strawberry-brown sugar, and I now have the ingredients for Key Lime. My wife loves ice cream, but it doesn't love her so we have been making sorbets lately instead. We've never tried frozen yogurt. We'll have to experiment with that. Right after our jalapeno sorbet experiment, of course. Is my friend John's blog about how he did it with some recipes. You can throw anything in there and it comes out good; I prefer the unflavored yogurt, the plain no-sugar variety. Greek is SO perfect.